I would presume that this artist now calls himself Bobby Blues Ray to distinguish himself from the Texas roots artist and also the country singer who recorded for Mercury. 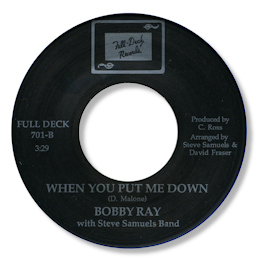 Of the songs that I've heard by Bobby Ray When You Put Me Down is easily the best, despite the dancer's favourite "Soul" 45. The rhythm section is very nicely arranged and the song itself has some fine chord changes, and all on glorious blue vinyl as well. But the emphasis here is all about Bobby. Whether he is caressing the lyric or screaming out his passion the vocal performance is impeccable. You gotta love the way he injects hoarse phrases especially towards the end of the track. The original of course was recorded by Bobby Blue Bland in 1964 and I yield to no one in my admiration and love of the great man but on this occasion I prefer the arrangement and the structure of Ray's version to Joe Scott's. Sacrilege! 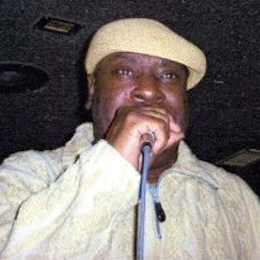 You can find more details about Bobby Ray and his music on his website here. Thanks to Dante Carfagna for extra discographical info.